Cindee graduated from the UBC dental program in 2000. While in dental school, she traveled with a team of doctors and one oral surgeon to West Africa where she extracted teeth for prisoners. Another mission trip in 2002 took her to Guatemala where she provided basic dental care in an orphanage. Cindee practiced general dentistry in Salmon Arm and Ontario before moving to Summerland in 2005. Dentist Cindee Melashenko, DMD, practices a full scope of general and cosmetic dentistry with expertise ranging from porcelain veneers to dental implants , crowns and bridges . Dr. Melashenko can now correct a wide variety of so-called permanent cosmetic dental problems, and can literally redesign your smile. 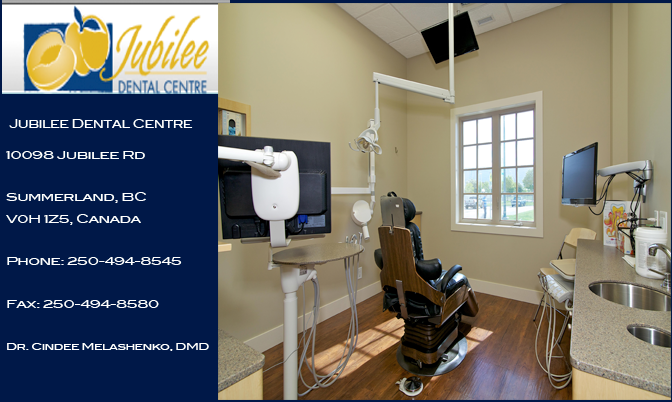 Our office is located at 10098 Jubilee Rd W, Summerland, BC. Call us at 250-494-8545. Dr. Cindee Melashenko and her team are dedicated to providing you with a pleasant visit and results that you’re proud to show off. Christien and Joel are ready to help you with questions about scheduling, financial policies, and insurance, to make that part of the process as simple as possible. Today’s advanced dental treatments and materials can give you a healthier, more complete smile that can last you a lifetime. Your Summerland, BC dentist, Dr. Melashenko, can help revitalize and maintain your teeth and gums, giving you the smile you’ve always wanted. Using advanced cosmetic dental treatments and materials, your Summerland, BC cosmetic dentist, Dr. Melashenko, can make a real difference. The skill, experience, and commitment of our practice — using a unique combination of science and artistry — can literally redesign your smile. At Dr. Cindee Melashenko, our team is prepared to answer all questions pertaining to your dental health and appearance. Oral hygiene, specifically brushing and flossing, are a vital part of your dental health. We can also answer your questions about the different dental specialties and explain the meaning of dental terms.